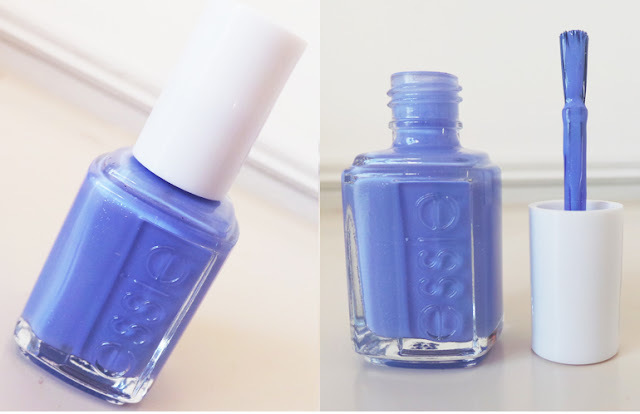 Essie Bikini So Teeny was released as part of the Essie Summer Collection 2012, and I remember it causing quite a stir around the beauty blogging world! Despite all the hype, I only got my hands on it around a month ago when I purchased it from Fragrance Direct for the reduced price of only £1.99! I would describe it as a creamy, pastel bluebell shade. I was a little surprised with the fact that if you look into the bottle you can see glitter specks, yet when painted onto the nails, this effect is barely noticeable. I found that the brush is really easy to work with as it's dense and flat, so gives super quick and easy coverage of the nail. It takes at least two coats to become opaque but does not dry streaky or patchy. I really love this shade, and I know it will be well used throughout the Summer of 2013, even if I am a year too late jumping on the bandwagon! What shades can you recommend trying out from Essie? Such a gorgeous colour ~ definitely going to pick this one up too! I really love this color its awesome and looking great. I have to buy one like this. Really love this colour Laura!! I have a similar one from Nails Inc but its slightly darker!! I am giving away a L'Oreal Infallible Eyeshadow in flashback silver (RRP £6.99) on Haus of Lola to celebrate my blogs first birthday!! You've gotta be in it to win it!! !